In this paper we aim to describe and explain current spatial distribution of creative industries in Czechia. We ask to what extent are localisation patterns of creative industries influenced by specific local contexts. Therefore, we employed a typology of regions (close to local labour areas) that may explain spatial distribution of creative industries: metropolitan cores, metropolitan hinterlands, old industrial regions, urban and rural regions. We use general linear models combining the regional typology as a fixed factor and four covariates – employment density, density of cultural industries, mean firm size in creative industries and diversity of economic activities. We employed horizontal localisation quotient of regional employment in creative industries for the year 2014 as a dependent variable. Our main finding is that the regional typology explains a higher share of variability of the dependent variable (relative specialisation in creative industries) than any other explanatory variable. However, after exclusion of metropolitan cores, the model lost a significant amount of its explanatory power. Urban size/density and position in urban hierarchy are the key explanatory variables. We found only limited empirical evidence that regional contexts affect localisation of CI – regions of similar population/economic size do not differ significantly in spatial concentration of CI. Blažek, J. and Bečicová, I. 2016. The takeover of Prague's banking cluster by multinational groups from an evolutionary perspective. Geografie 121. (2): 254–278. Ciccone, A. and Hall, R.E. 1996. Productivity and the density of economic activity. American Economic Review 86. (1): 54–70. Cruz, S.S. and Teixeira, A.A.C. 2015. The neglected heterogeneity of spatial agglomeration and colocation patterns of creative employment: evidence from Portugal. Annals of Regional Science 54. 143–177. CSO 2009. Register of economic subjects in selected production industries. Prague, Czech Statistical Office. CSO 2014. Register of economic subjects in selected production industries. Prague, Czech Statistical Office. CSO 2018. Public database. Prague, Czech Statistical Office. Dostál, P. and Hampl, M. 1994. Changing economic base of Prague: towards new organizational dominance. In Development and Administration of Prague. Eds. : Barlow, M., Dostál, P. and Hampl, M., Amsterdam, Universiteit van Amsterdam, Instituut voor Sociale Geografie, 29–46. Gregory, J. and Rogerson, C. 2018. Suburban creativity: The geography of creative industries in Johannesburg. 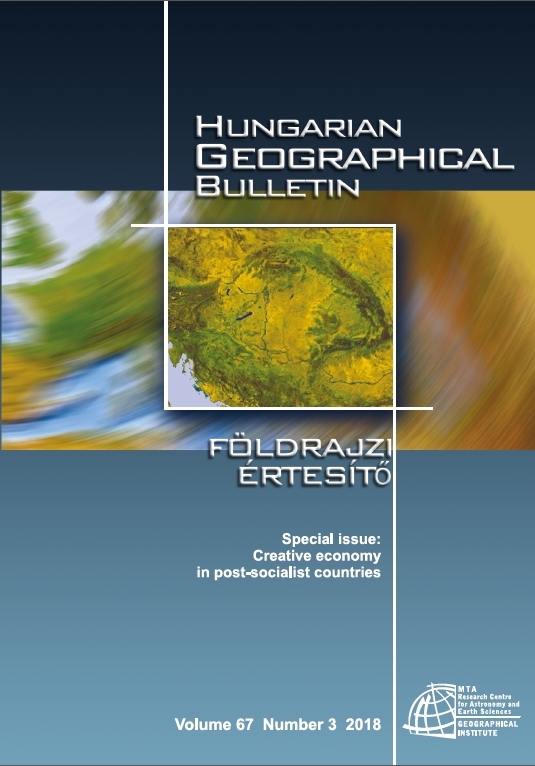 Bulletin of Geography. Socio-economic Series 39. (39): 31–52. Hampl, M. 2005. Geografická organizace společnosti v České republice: transformační procesy a jejich obecný kontext (Geographic organization of the society in the Czech Republic: transformation processes and their general contex). Praha, Demo Art. Hampl, M. and Marada, M. 2015. Sociogeografická regionalizace Česka (Socio-geographic regionalization of Czechia). Geografie 120. (3): 397–421. Ivan, I., Raabová, T., Slach, O. and Žáková, E. 2015. Kulturní a kreativní průmysly v Brně a v Ostravě: Specializovaná mapa s odborným obsahem (Cultural and creative industries in Brno and Ostrava: specialized map with a technical content). Praha, Institut umění − Divadelní ústav. Lorenzen, M. and Frederiksen, L. 2008. Why do cultural industries cluster? Localisation, urbanization, products and projects. In Creative Cities, Cultural Clusters and Local Economic Development. Eds. : Cooke, P. and Lazzeretti, L., Cheltenham, Edward Elgar, 155–179. Massey, D. 1984. Spatial divisions of labour: Social structures and the geography of production. Basingstoke, Macmillan. Musterd, S. and Gritsai, O. 2010. Conditions for 'Creative Knowledge Cities'. Findings from a comparison between 13 European metropolises. 'Going Creative' – an option for all European cities? ACRE Report WP9. Amsterdam, AISSR. Novotný, L., Hruška, V., Egedy, T. and Mazur, M. 2015. Defining rural areas of Visegrad countries. Studia obszarow wiejskich / Rural Studies 39. 21–33. Power, D. 2011. Priority sector report: creative and cultural industries. The European Cluster Observatory, European Commision. Rehák, Š. and Chovanec, M. 2012. Exploring spatial patterns of creative industries with firm level micro geographic data. Region Direct 2. 10–35. Rumpel, P., Slach, O. and Koutský, J. 2010. Creative Industries in Spatial Perspective in the Old Industrial Moravian-Silesian Region. E+M Ekonomie a Management 8. (4): 30–46. Šimon, M. 2017. Multi-scalar geographies of polarisation and peripheralisation: A case study of Czechia. Bulletin of Geography. Socio-economic Series 37. (3): 125–137. Slach, O., Bosák, V., Ženka, J. and Pavlík, A. 2018. Vznik a role znalostně náročných obchodních služeb ve starých průmyslových regionech: perspektiva evoluční ekonomické geografie (Birth and role of knowledge-intensive business services in old industrial regions: a perspective of evolutionary economic geography). In Rozmístění služeb v Česku. Eds. : Ženka, J. and Slach, O., Ostrava, En Face, 98–123. Slach, O., Koutský, J., Novotný, J. and Ženka, J. 2013. Creative Industries in the Czech Republic: A Spatial Perspective. Ekonomie a Management 6. (4): 14–28. Storper, M. 2013. Keys to the city: How economics, institutions, social interaction, and politics shape development. Princeton, Princeton University Press. Ženka, J. and Slach, O. eds. 2018. Rozmístění služeb v Česku (Spatial distribution of services in Czechia). Ostrava, En Face. Ženka, J., Slach, O. and Sopkuliak, A. 2017b. Typology of Czech non-metropolitan regions based on their principal factors, mechanisms and actors of development. Geografie 122. (3): 281–309.